What many online poker players do not realize is the difference between a poker cash game and a poker tournament. There is a very big difference in the strategy and if you are going to play these two different styles of poker games you must know the difference. The very best way to make a profit playing poker is from cash games. A solid cash game strategy will allow you to make a lot of money, time and time again whether you are playing Texas Hold’em or your favorite poker variation. Before you start thinking about the strategy of a cash game you must keep in mind how important patience is. There are a variety of attributes that will help you win a poker game but this is the number one thing that will help you win in a cash game. In a tournament, you are often pushed into making decisions that you don’t want to make. Blinds are constantly raising and you have to make a move eventually. You can sit in a cash game for 9 straight hours before playing a hand and you will not lose out too much. Whether you are a tight player or an aggressive player you can find a way to win a cash game with the right strategies. When you are playing in a cash game you should always be giving yourself the best opportunity to win the most amount of money. If you are not a favorite to win then you shouldn’t be in the hand unless there is enough money in the pot. You just simply have to be able to make money over the long haul. There is not a reason to rush anything and go in on hands that you are not comfortable with. At the same time, you cannot be afraid to lose your money. You have to have a nice median between the two. Check our calculating the odds article or pot limit Omaha odds page for further information to help you successfully play the odds. 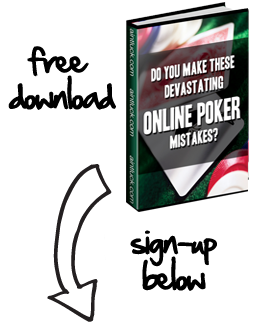 One of the biggest misconceptions is that you should play more hands in a cash game. This is completely untrue. There is no reason for you to play more hands in a cash game than in a tournament. More than your hands you should be concentrating on your opponents, position and pot odds. All of these factors are more important preflop then your hand. You should look at those things first, then look at your hand and decide what to do with it. The saying, “quit while you are ahead” is for blackjack players and craps players, not poker players. Unless you are playing with luck and no skill, there is no reason to quit while you are ahead. Why would you quit when you are making money and doing well in a poker game? Instead, you should be taking advantage of being ahead and doubling what you are already ahead by. The only way you should be quitting while you are ahead is if you have problems with discipline. If that is the case, then you should not be playing poker in the first place. Stick to the basic rules of poker and you are going to be just fine in a cash game. There really is no set specific cash game strategy because everyone has their own playing style. No matter what your style is the above tips are going to help your game. The best poker players in the world don’t make their real money at the WSOP, they make it in the big cash games that happen after and before the WSOP. That is where you will make the real money in poker.